Bay Area Soft Shell Crab Season has arrived! Offered on both RN74’s dinner and lunch menus is a Crispy Soft Shell Crab with Ginger and Celery Leaf Remoulade. 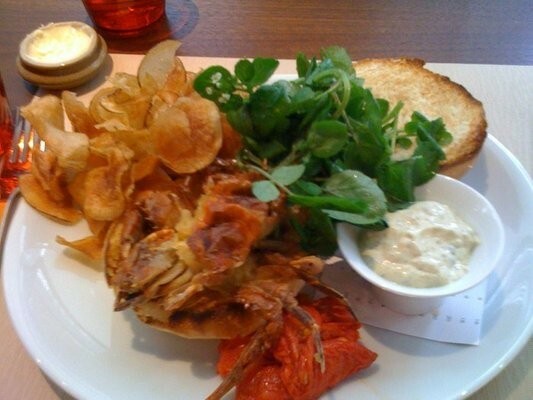 The restaurant’s bar menu also features a Soft Shell Crab Sandwich with Oven Roasted Tomatoes, Caper Aioli, and Arugula with Old Bay Fries. The crabs come exclusively from the East Coast and are served simply fried with a remoulade sauce made of ginger, lemon zest, chinese celery leaf and a pinch of jalapeño. The sauce is tasty and serves as a simple accompaniment for the crab without overpowering it. For lunch, Madera is offering a Tempura Soft Shell Crab with Purple Cabbage, Baby Radish, Kimchi Aioli and Tobiko, for dinner, a Soft-shell Crab Tempura with Fresh Yellow Curry, Carrots, Raisins and Fava Beans and at the lounge, a Soft Shell Crab “BLT” with Applewood Smoked Bacon, Lettuce, Tomatoes, Garlic Aioli on a Brioche Bun. Rosewood Sand Hill’s signature Michelin-starred restaurant, Madera, offers local residents and hotel guests a comfortably elegant ambiance with a wood-burning display kitchen, picturesque views and charming outdoor terraces and seating. La Toque is offering a Maryland Soft Shell Crab with Fregola Sarda and Pesto. 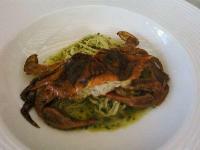 Pesto and soft shell crab have long been one of Executive Chef Ken Frank’s favorite combinations. Toasted Fregola (aka Sardinian cous cous) is the perfect pasta to use in his dish. Chef Frank creates his menu of contemporary French cuisine using the region’s bounty of seasonal, fresh produce and organic meats sourced from a network of local farmers and purveyors. FARM at the Carneros Inn is offering a Chesapeake Bay Soft Shell Crab with Chow-Chow, Daikon Sprouts, Scallion Sauce, and Red Pepper Jelly, created by Chef de Cuisine Andrew Budnyj. FARM at The Carneros Inn, the resort’s newest restaurant, offers a relaxing, authentic, elegant and exciting wine country dining experience. The menu reflects the Inn’s commitment to simple food that is complex in flavors, highlighting the abundance of organic and sustainable local agriculture found primarily within a 150-mile radius of the Carneros region to ensure food that is at the peak of its season and flavor. Many of the ingredients are sourced on-property, including herbs, apples, figs, pears and pomegranates. Once soft shell crabs are on the menu, you know it is summer time. They are available from late spring through early fall, but chefs are usually done with them by July. These rare crabs are sweet and tender; a very succulent entrée item. Dive into the nearest San Francisco restaurant and take advantage of this delicious seasonal item!